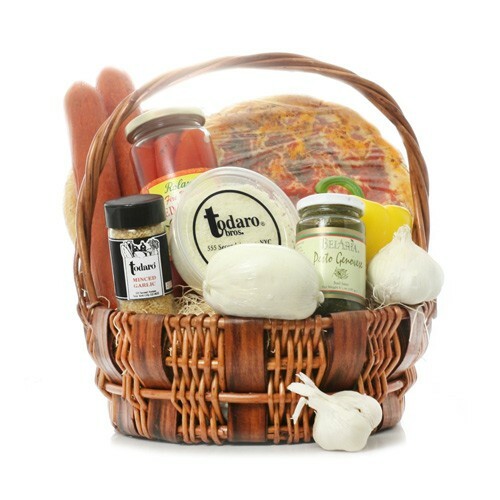 A fun-loving, flavorful gift for a get together, a teenager or student, or the aspiring chef! Create two medium pizzas with all of the ingredients at hand: two fresh focaccia breads; one fresh ball of homemade mozzarella cheese; 2 sticks of pepperoni; marinated mushrooms; roasted red and yellow peppers; anchovies; grated cheese; and mixed Italian herbs and seasonings. A delicious, delightful meal for four! Occasionally substitutions of equal value must be made but the theme of the basket is always consistent.